It is no longer news that a four year degree programme in Nigerian government owned institution is now five years or even longer as one year is specially reserved for strike actions. It is endemic that today the academic quality of Nigerian government owned institutions has declined drastically, with institutions either been over populated, understaffed or staffs been denied their pays. Intriguing and highly impossible as it may sound for politicians to donate their allowance, in 2015 Senator Ben Murray-Bruce representing Bayelsa East had donated his wardrobe allowance to the unpaid workers in Osun state and widows in his community at Akasa, Bayelsa state. In the same light Nasir El-Rufai, shortly after been sworn in as the Governor of Kaduna state had announced the decision of both he and his deputy, Bala Barnabas Bantex, to sacrifice 50% of their salaries for the development of the state. Similarly in 2011 Governor Rochas Okorocha of Imo state had donated his salary for free education in Imo State. It is common knowledge that the strike action embarked upon by ASSU NSUK chapter is justifiable, if one thinks the strike is unjustifiable, then I think one should ask him/herself this questions, "can a Governor, sitting Senator or House of Representative Member be willing to forfeit his/her monthly salary, security vote and several allowances accorded him/her? NO. "Has it ever been recorded in Nigeria that legislatures went on strike due to lack of salaries or allowances? Another No. These allowances run into millions of Naira, going by the remuneration approved for them by the Revenue Mobilisation, Allocation and Fiscal Commission (RMAFC), the annual take-home (excluding estacode, Duty Tour Allowance (DTA) and some sundry allowances which they are paid as necessary), of each of the 360 members of the House of Representatives is estimated at N18.26 million. Each of the 109 senators earns a bit higher, pocketing N19.66 million each a year, Additionally, each senator collects N1.01 million a year for his or her domestic staff, while each member of the House of Representatives collects N1million for the same purpose. Yet the allowances, which are non-taxed are about 870 percent (Senators) and 820 percent (Reps) of their basic salaries. Yet these individuals are products of several citadels of leaning who were tutored by teachers. The same teachers they have vehemently denied their allowances since 2009 and Nigeria continues to suffer from unpaid workers. On the 19th of March, 2016 Osun state government declared publicly its inability to pay workers. Yes the Osun state government can't pay its workers but salaries and allowances for its politicians from the federal government are unrestrictedly paid. 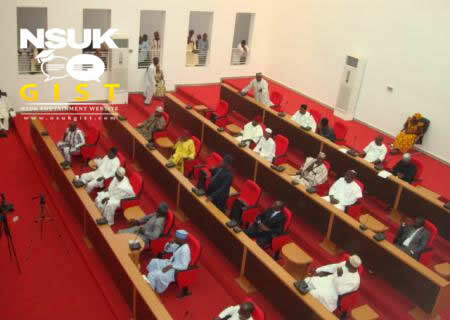 Summing up the Governor's salary and allowance, with three Senators representing Nasarawa State in the Upper House and four House of Representative members representing Nasarawa State in the Lower House and twenty four State House of Assembly members. The amount required to call off the strike is a stipend compared to what these legislatures receive as yearly allowances. Yet these are individuals whose priority should be the well-being and welfare of their constituents.